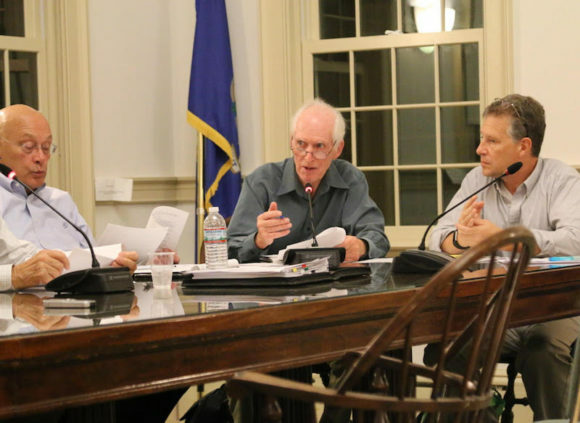 Zoning Commission members discuss the upcoming vote at Tuesday night’s meeting. Photos by Debra Joy. 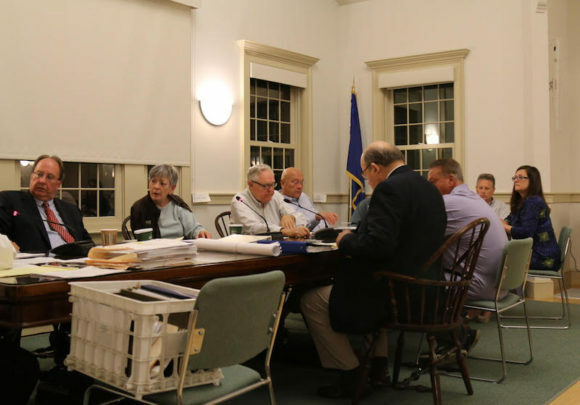 By a vote of 3–2, the Old Lyme Zoning Commission Tuesday night approved the Neck Road affordable housing project known as River Oak Commons I and II. Zoning Commission Chairman Jane Cable and commission members Gil Soucie and Alan Todd voted in favor of the proposal while commission members Jane Marsh and Paul Orzel voted against. From left to right, Zoning Commission members Paul Orzel and Alan Todd discuss HOPE’s zoning application while Zoning Commission Alternate Harvey Gemme listens carefully. 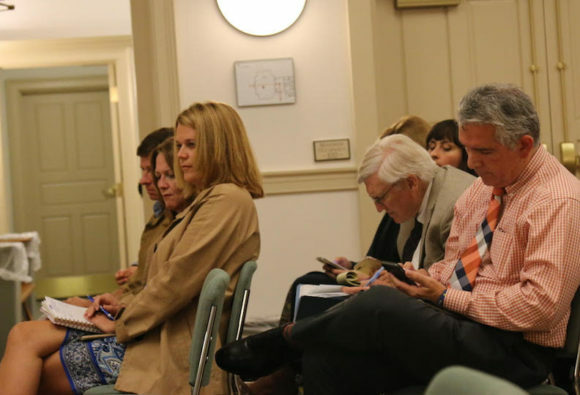 HOPE Executive Director Lauren Ashe (left) watches the proceedings at the meeting while HOPE board member Tom Ortoleva (right) and HOPE project attorney David Royston (second from right) check their phones. Attorney for the Zoning Commission Matt Willis drafted two motions for this meeting: one approving the project, and one denying it. The motion to approve, which includes 17 conditions that must be met before construction may begin, was read aloud. Brief discussion followed, followed by the vote. The denying motion was not read aloud, Cable said, because the motion to approve passed. Zoning Commission member Jane Marsh carefully studies a document during the hearing. 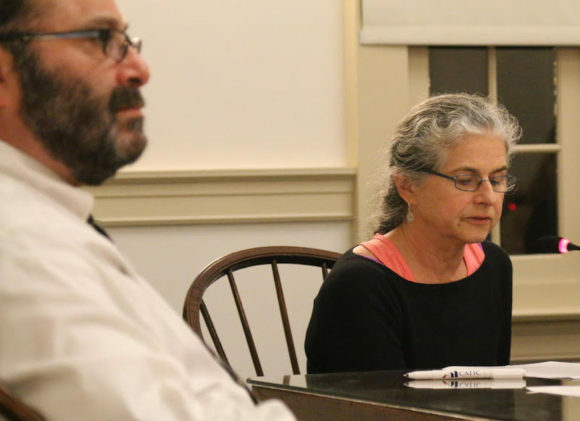 During the discussion, commission member Jane Marsh said, “I don’t think it’s the intention of the state legislature that we should rubber stamp” affordable housing projects. If that is the case, she asked, ‘Why are we even sitting here?’” Asked later whether public safety concerns voiced by citizens at numerous public hearings should have had some influence on the commission’s decision, Marsh said, “I believe we have a responsibility to consider the opinions” of the public. 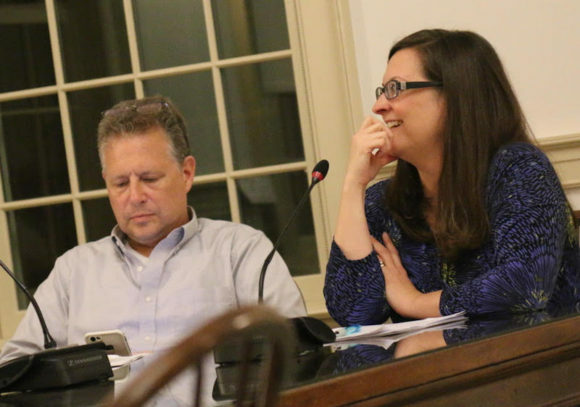 Old Lyme Zoning Commission Alternate Member Stacey Winchell (right) enjoys a lighter moment during the meeting. Harvey Gemme sits to her left.